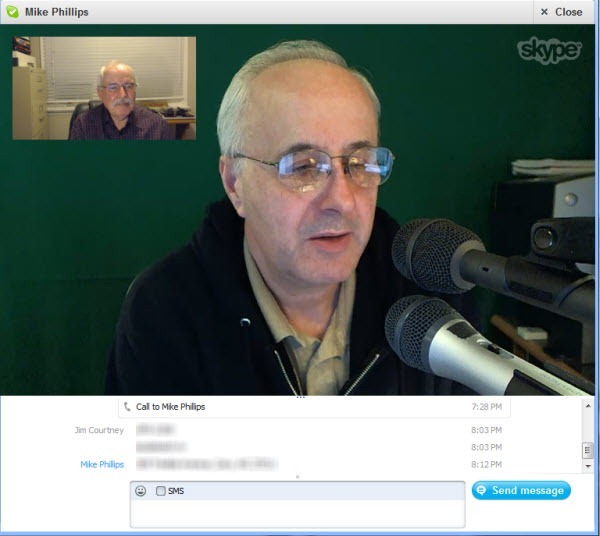 From the time just over four years ago when Skype introduced High Quality Video at VGA (640 x 480) resolution and 30 frames per second (“fps” or “frame rate”) I have had the opportunity to test many webcams for Skype Video calling. In the fall of 2010 I reported on the launch of HD Video calling (1280 x 720 or “720p” – @ 22 fps) using webcams from FREETALK and FaceVsion. 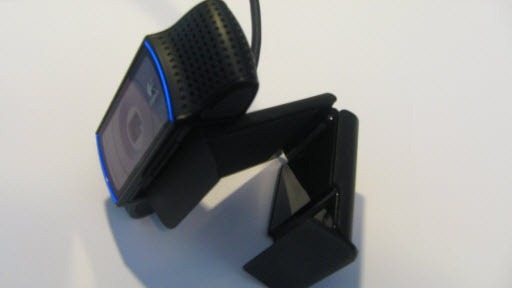 In the spring of 2011 I first tested a “conference room” video webcam from FREETALK; “conference room” webcams are suited for covering the longer range typical of a small-to-medium conference room size rather than a close-up desktop PC webcam for both video and audio. Having made several calls with the C920; they have been my best Skype video calling experiences of all. I am using a Dell Vostro V410 quad core PC that is about four years old. Requirements include: dual-core 2.0GHz processor, Windows XP/Vista/7, Skype 5.7 for Windows beta or later, Internet upload/download speeds as discussed below. Previously Skype had specified 1.2 Mpbs upload speed as the minimum required. However, when I started receiving calls last fall from contacts with recent Logitech webcams (C310, C510, C910 and Webcam Pro 9000) I noticed that they went to 720p yet I confirmed that my contacts on these calls only had 1.0 Mpbs maximum upload speed. This was my first clue that Logitech had developed a webcam that allowed HD video on the very common broadband Internet services that cap out at 1.0 Mbps upload speed (and without an onboard H.264 processor). If you are looking to have the best overall Skype video calling experience from a Windows PC, it’s well worth spending the $99 to achieve it. Also worth noting is that on launching a video call with previous webcams it would start out at VGA resolution (640 x 480) but took from 30 seconds to 3 or 4 minutes to go into 720p HD mode (as can be seen by the change in aspect ratio and confirmed by Call Technical Info). The C920 would get to 720p resolution within 15 to 45 seconds on all my calls. My service has a 2.0 Mbps upload speed; however, in practice it usually delivers 1.6 to 1.85 Mpbs upload speed. So while I was expecting to easily get to 720p I was only being hopeful (or lucky) if a call went to 1080p. When you initiate the C920 webcam (either when launching a call or by turning on the webcam during a call) it comes up almost instantly with a video image; no swirling icons waiting for the webcam to get started. But the other noticeable difference was that it usually takes less than 30 seconds for the webcam to start delivering HD video at 720p. 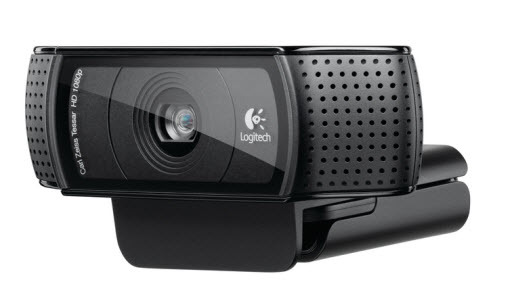 One other noticeable improvement was that the Logitech C920 is the only webcam that delivers 720p at 30 fps whereas the other HD webcams could only go to 22 fps. (Not a terribly noticeable difference but it becomes television quality with no choppiness or pixilation). Overall one has a much improved call initiation experience and on all calls to other PC’s it has always switched to 720p HD in somewhat less than a minute. All of my calls went to 720p at 30 fps as would be expected with my service’s upload speed; however, I did have two calls go to 1080p at 21 fps after about 10 to 20 minutes (remember I’m not supposed to get 1080p at all); this held for the last 20 to 30 minutes of those two calls. From the call technical info I could also see there was less demand on my CPU processors than I had previously experienced (usually had been well over 50%). 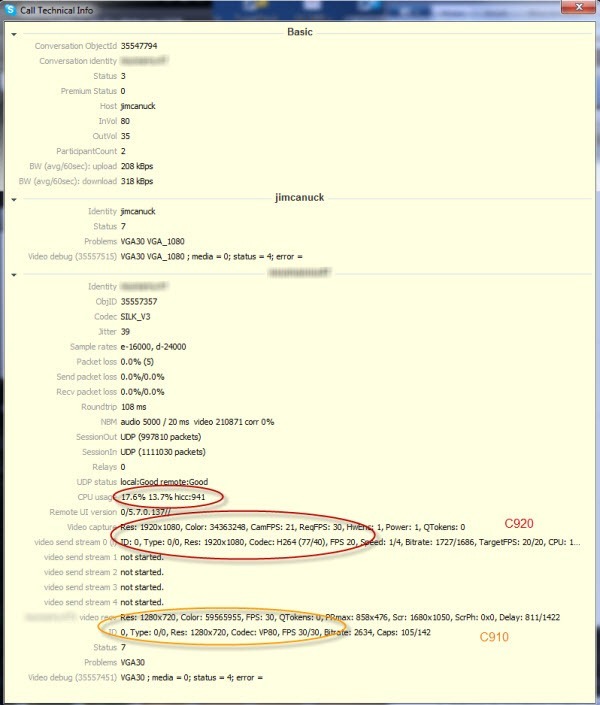 Note that these calls were to users with Skype for Windows or Skype for Mac; a call to Skype for iPad (to an original iPad) was observed to be at VGA resolution (640 x 480) at 15 fps; a call to Skype for TV on the TelyHD device went 720p at 15 fps on both sides of the call. In other words, the combination of Skype and the webcam will adapt resolution and frames-per-second to the resources of the device at the other end of the call. 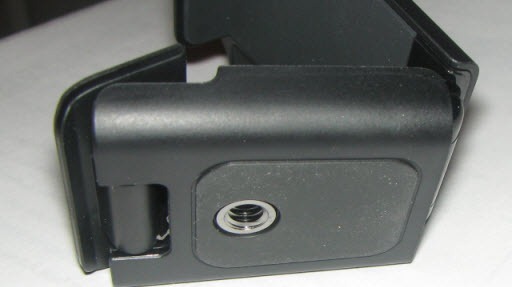 The mounting bracket – one other feature that was immediately obvious was the flexibility of the mounting bracket. Using a combination of hinges and rubber surfaces, it easily mounts onto the top of any flat panel display; yet it can also sit on, say, a desktop surface. Not only does it mount readily and firmly but when on the display frame it can easily be titled up and down. Finally the underside has a tripod thread such that it can readily be mounted on any tripod. Web Gallery – storing and editing recordings with the ability to download to Facebook, Twitter and YouTube or to share via email. Audio: The C920 also includes a microphone on each side to pick up a stereo effect and making it suitable for larger distances in, say, a small conference room. I was able to test this out in a small office environment during an HD video call and found it to work satisfactorily. While the other party on a 90 minute call reported that there can be a bit of “barrel” effect, Skype’s echo cancellation worked perfectly. Previous webcams with H.264 onboard processors took 30 seconds to 3 minutes to go to HD resolution; they capped out at 22 fps. They required 1.2 Mpbs upload speed and would take 15 seconds to a minute from launch just to show an image. The previous Logitech HD webcams had no onboard processor (in other words they did their video processing on the main PC using up CPU cycles); they went to 720p resolution on services with only 1.0 Mbps upload speed. The Logitech C920 turns on immediately, goes to 720p HD much more quickly (15 to 45 seconds), goes to 30 fps – and it goes to these performance levels consistently when calling another PC. The Logitech C920 reduces the demand on your main PC processor and bandwidth requirements. It allows a much better experience when recording a video call with, say, VodBurner, reducing wait times and quality loss that would arise from encoding on the main PC. What does the other party have? I have made calls where the other party had various Logitech webcams (C310, C910 and 9000 Pro), a recent MacBook Pro webcam and a FREETALK Everyman HD webcam. In every case my experience with the the C920 was as described here. Of course to receive HD video they must have at least a 1Mbps download speed (usually not an issue with any broadband Internet service) and a recent version of Skype – Skype 5.x for Windows, or Skype 5.3 for Mac or later. It also worked at 720p HD on a call to Skype for TV on the TelyHD device. It makes calls, but at VGA or loeer resolution, to Skype for iPad and Skype for iPhone. There was one instance where the other party switched to an older non-Skype-certified webcam during a call (from a Logitech C910) and basically we could not get any semblance of good call quality. On the other hand it appears to work well when the other party is using a webcams built into laptop and flat panel monitor displays. Skype Group Video Calling: While Skype Group Video Calling only delivers VGA resolution, due to screen real state issues when showing up to 10 participants and desktop sharing, I would expect this webcam to perform better in terms of speed to get into a call and robustness during a call as well as demand on the local CPU resources. I’ll report back after my next group video call later this week. If you have sufficient Internet connection upload speed, it delivers 1080p video at a reasonable frame rate. Its optics deliver the best quality images when it comes to natural colors and color depth, sharpness and dealing with lighting issues. It easily adapts to mounting on any monitor or laptop display, work surface or tripod. It includes a recording ability with single click download to Facebook, YouTube and Twitter. As mentioned at the beginning I have followed Skype video calling for over five years; I have checked out many webcams, especially when it comes to HD video. If you are looking to have the best overall Skype video calling experience from a Windows PC, it’s well worth spending the $99 to achieve it. The Logitech C920 is available on Amazon and at electronics retailers such as Best Buy. In another post I’ll talk about successfully recording a Skype video call using this webcam and VodBurner. Unfortunately, at this time, there are no plans to provide Mac support for the C920; however, I suggest keep checking our website as we are always coming out with new solutions. Currently the Logitech C910, as shown in the chart above, does support the Mac and offer most of the C920 features except support for 1080p and the onboard H.264 processor as the major omissions.